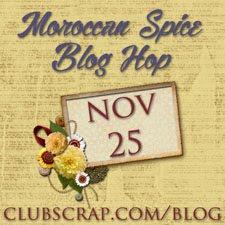 Finishing up the challenges at OWH's virtual cardmaking party. Yes, I think I did all 18 challenges over the past four days . . . whew! It's been a while since I did so much papercrafting. For THIS challenge, we were to make two similar cards, but one was to be "thick" and a card sent TO a service member and another "thin" to be donated to OWH for a military man or woman to send home. I chose buttons as my thick and thin element. We aren't supposed to use thick embellishments on cards that the troops send home, because of the additional postage required. However, they also accept cards and letters TO service men and women. Everyone needs a word of encouragement, right? So, the first card has real buttons on it. I'll write a message inside and it will be given to someone at one of the units. This card will go in a box for a someone to choose to write home on. 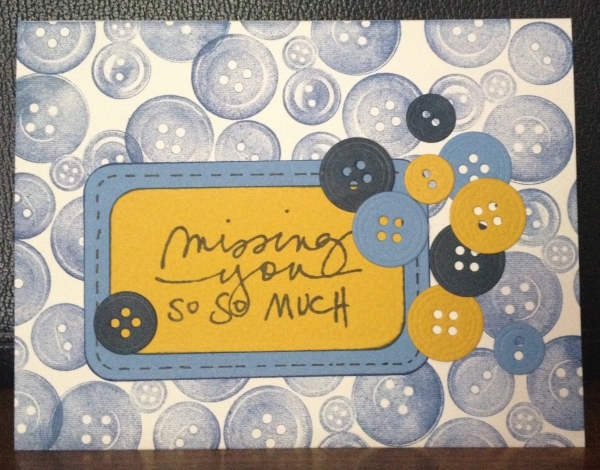 (I love "missing you" sentiments on cards.) The buttons are die cuts, so they are paper thin--no extra bulk or unevenness that the post office frowns on. Now my studio needs a good straightening up after making all those cards. It was fun, though, and I'm glad my mojo is back! Thanks for participating in my challenge! 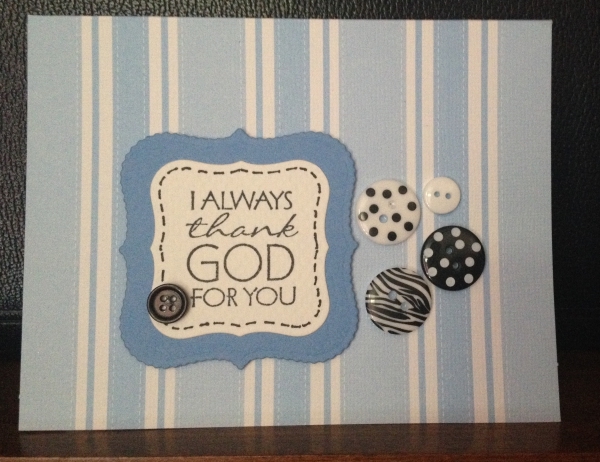 and fun that you continued button theme on other card!